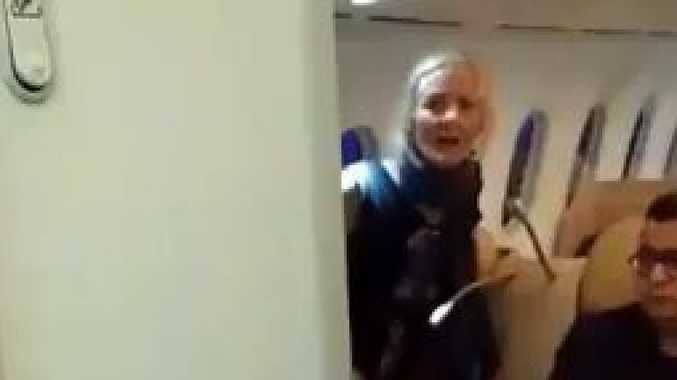 A WOMAN was arrested after going on a racist, expletive filled rant during a flight to London after crew refused to serve her more wine. The 50-year-old woman, believed to be Irish, reportedly launched a drunken tirade against the Air India crew, with clips of her "shameful" rant shared across social media. "I am a f***ing international lawyer. I work for all you f***ing people ... The f***ing Rohingyas, the f***ing people of all Asia, for you, an international criminal lawyer. Don't get any money for it by the way. But you won't give me a glass of wine, is that correct?" she can be heard shouting at a crew member. She then asks if they "treat all business class passengers like this?" before saying she would have been served if she was a "rich Indian f***ing money grabbing b**tard". The video shows her even getting phsyical with some of the flight attendants, with one of the staff members showing a bruise the woman allegedly left on her. Many people praised the calm way the staff reacted to the horror situation. Metropolitan police said the woman was arrested when the flight landed "on suspicion of racially aggravated public order, common assault and drunk and disorderly".